Lauren Vladyka named as Recipient of the Fur Ever-Le Scholarship! Congratulations to Lauren Vladyka for being named the recipient of the 2018 annual Fur Ever-Le Scholarship. The Fur Ever-Le Scholarship is named in honor of former Knight player Leanna Previte. It is awarded each year by the Club to an graduating female soccer player who will be continuing her soccer career at the college level. 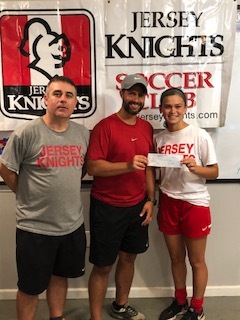 Lauren, a member of the JK Force and a recent graduate of Franklin High School, will attending and playing soccer for Ramapo Universtiy in the Fall. Good luck Lauren!